As we sit here on the Jolifou in the beautiful Blue Pearl Bay, it is 8PM (half hour to cruisers midnight) on a perfect evening. 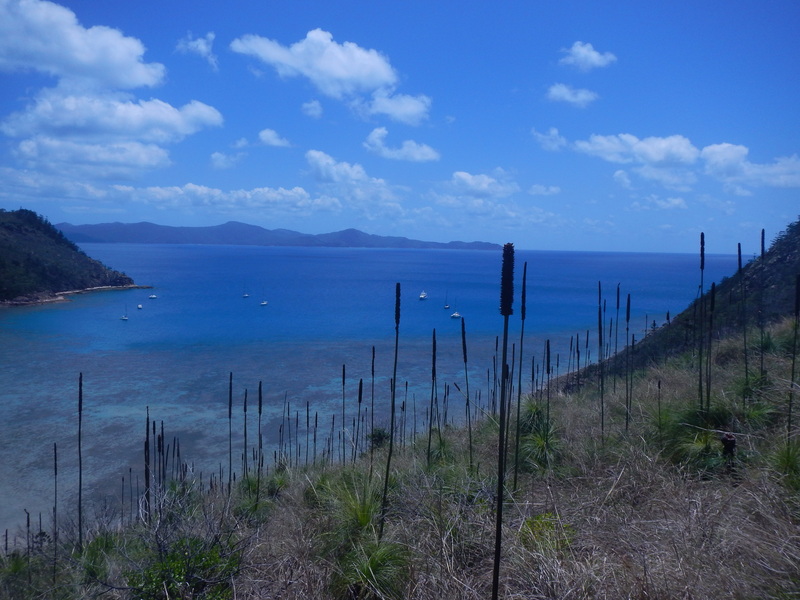 Sea is calm, wind is light, a perfect anchorage but for the fact that there are 20 other boats here, most notably a few of the back-packer charter boats from Airlie that arrived late in the day. The serene night air is harshly cut by the techno music and shouts of partyers. Never mind, we were all young once right and there are plenty more serene bays out there. We will sleep well anyway because it’s been a big day. 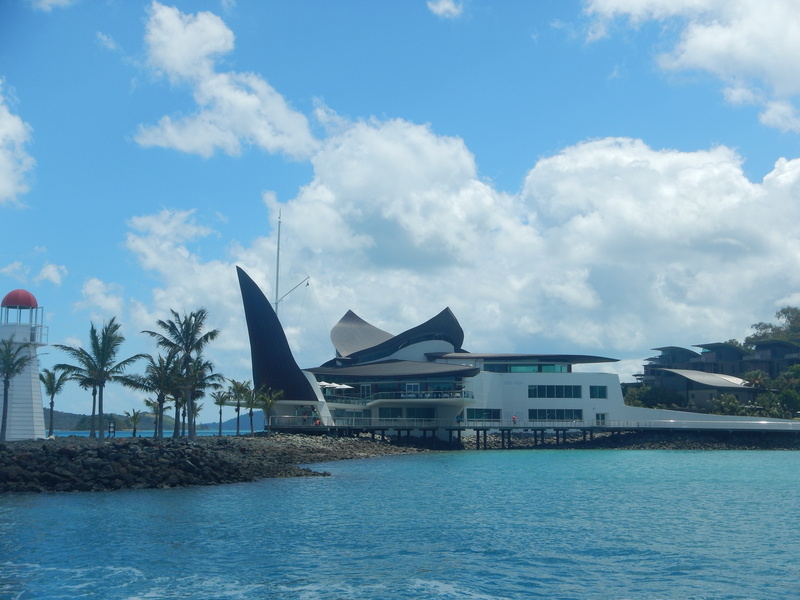 It was wonderful to catch up with Joe and Belinda and the kids Karma and Drew in the marina at Hamilton Island. 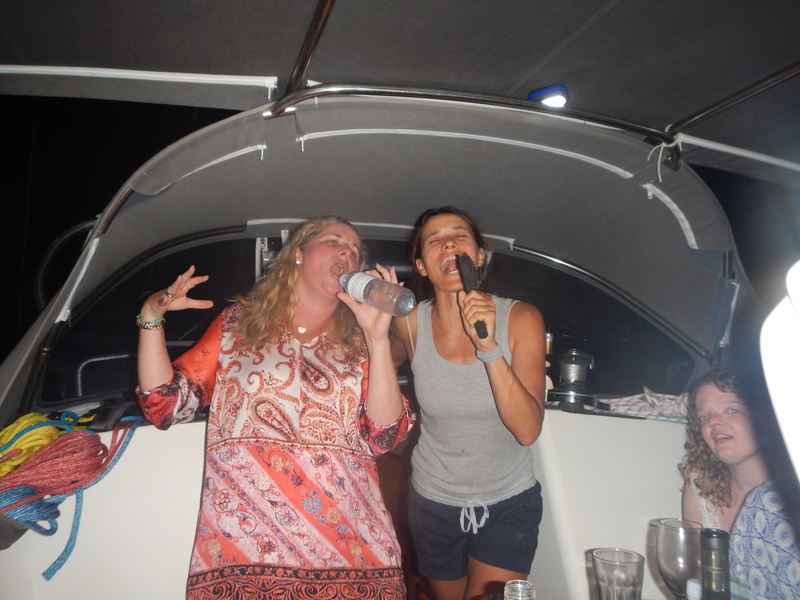 We decided that the pricey marina fee would be worth it to properly welcome two of our best friends. Indeed, were it not for Joe we would not have the JoliFou so we owe him big, but more than that they are friends that go back a long way and we always enjoy their company immensely. As we pulled into the finger of the Marina the first boat we saw was their Lagoon 40 catamaran “One More”. We had dinner onboard “One More” and enjoyed meeting Katrina and Chris and their lovely daughters Sarah and Emma and son Angus. Somehow after the nth drink we were talked into returning the golf cart for them the next morning so they could make an early start. This suited us just fine as we partook of a bit of a whirlwind tour of Hammo on the golf cart whilst we awaited the opening of the bottle shop (as you do). In short, the marina area is quite quaint, the resort rather ugly especially the huge block of apartments, the yacht club is stunning with amazing architecture really well done. The over-riding impression is crowds. Golf-carts and people buzzing around everywhere! Probably this is not so bad outside of school holidays, but I found myself really rushing to prepare the boat to leave as soon as possible – we just had to get out of there! We left the mainsail covered and broke out the Gennaker in the 18 knot South Easterly for a very pleasant reach up to the top end of Hook Island, where we were to meet “One More” at Butterfly Bay. On the way we crossed paths with our friends on Mahiti, who were unfortunately going the other way, on their way to pick up a friend at Hammo. Of course there were no moorings available any more at Butterfly Bay by the time we got there, but this time we did successfully anchor. We are getting better at anchoring in deep water. It was a wonderful surprise to come across Adrian and his stunning 60 footer “Anthem” which we had last seen in the shed at Joe and Belinda’s boatyard in Newcastle over a month ago where Adrian had been working on it and project managing the refurbishment. The result is a gorgeous boat, which is also aluminium so we feel a bond. Adrian and family and the “One More” gang came for drinks on JoliFou, then we had dinner on “One More” (again). This morning we finally touched the rock again, on an interesting little slab we had scoped out whilst taking Silus ashore. The whole gang from all 3 boats rocked up (ha ha). The rock was a bit crumbly in places, tried leading the climb and my first cam placement pulled straight out with a shower of rock fragments – hmmmm. Plan B, we setup a top-rope by climbing up a much easier route. Joe and Belinda’s lovely daughter Karma was given first attempt. Karma is a very keen and proficient indoor climber and boulderer but has little experience on rock and the crux was just beyond her reach (literally). Bruce managed to get up and become the first ascender, with no thanks to the sledging from the peanut gallery below. Halfway up a march fly attacked him and had to be killed before continuing. I hereby name this climb “Fly Shake” (16) after the body action that was done by myself and many of the other climbers of the day to prevent a painful sting from a march fly. Lyn shot up the rock straight up the middle, apart from one small slip it was the best ascent of the day. Joe and Adrian also managed to get up, though the judging panel did note some out of bounds infractions. Adrian’s niece Ruby had a very good attempt despite never climbing before, as did young Emma. Karma had a second attempt and came very close despite energetic attention of the march flies. 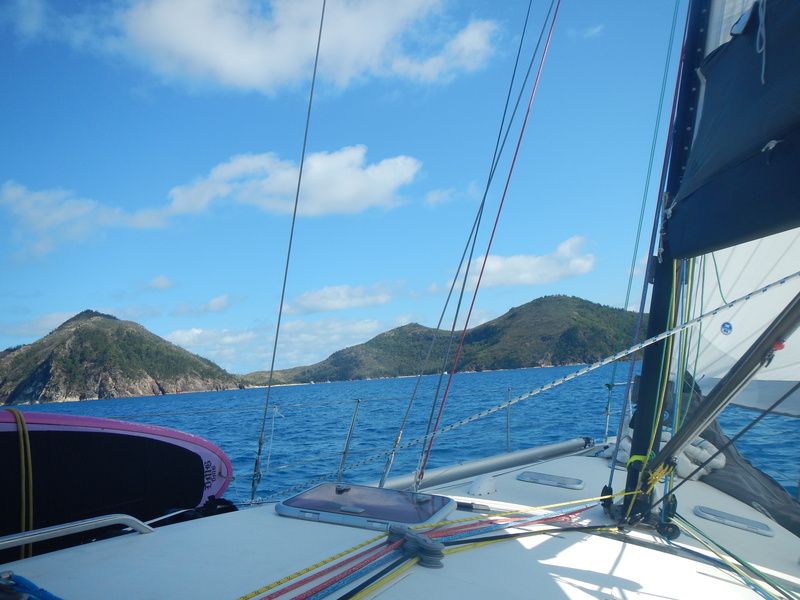 The 3 boats then set off for Blue Pearl Bay on the North Western side of Hayman Island, just a few miles away. This afternoon we had a nice dive with Adrian and Ruby at the Northern side of the bay, thanks to Adrian filling our tanks with his compressor. In places the coral was stunning, in other places dead. Adrian did the same dive back in 2004 and he says he can’t believe how the coral has degraded since then – a sobering thought. Highlight of the dive for Lyn and I was seeing a huge Potato Cod up really close. At sunset we enjoyed drinks on the beach with the crews of Anthem and “One More” and were also joined by Craig from “Ocean Star” and met his lovely partner Nelly. Plan is to go out to Bait Reef again tomorrow along with “One More” and Anthem, probably a super early start. A big day is a good day. Somehow the fun energetic activity feeds your personal energy and you find yourself taking on more. By the end of the day you are totally spent, but with a glow of happiness fed by the joyful memories of a day well lived. Yesterday was such a day, no doubt. Silus and Lyn, Off Watch! We awoke at Blue Pearl at 2:40 AM, for a 3AM start. After some initial struggles with getting the anchor up we finally set off. Lyn had permission to go back to bed and I unfurled the jib and later hoisted the mainsail double-reefed and enjoyed a beautiful sail into the sun-rise in the moderate South Easterly. On arrival at Bait Reef there were just 3 un-occupied moorings available inside the stepping stones – 2 public and 1 private (no anchoring allowed here). We picked up one and then chatted on the VHF to Anthem and “One More” who had left a bit later than us. They were now engaged in a life or death struggle to get to the Reef ahead of each other and a charter motorboat to claim the last moorings! I went out in the dinghy to act as finish boat. Joey was taking no chances and came flying in, full noise, to take the honours and the final public mooring. Adrian had left Anthem with a little too much to do, and had to settle for wooden spoon. I hopped aboard and guided them around to the Manta Ray wall mooring. With me steering and Adrian picking up the mooring there were a few moments of concern as we were quite exposed meters from a lee reef in quite wavy windy conditions. 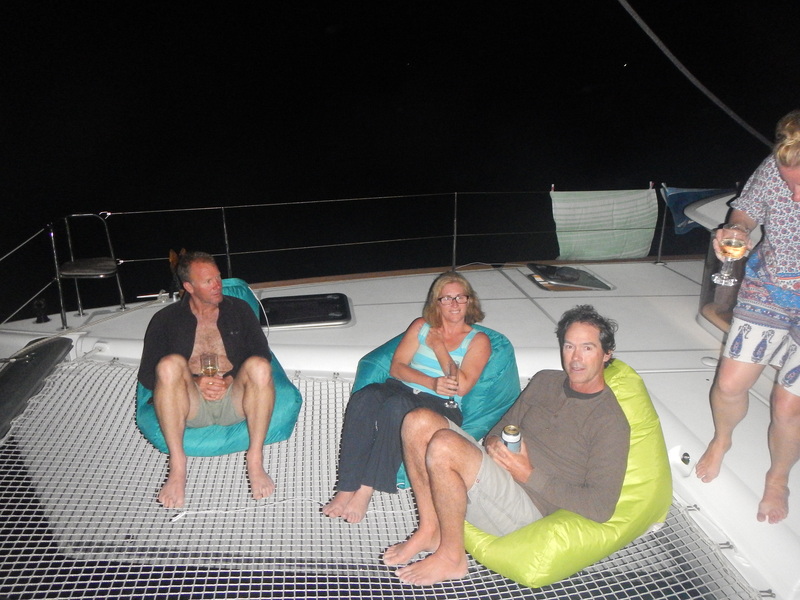 Fortunately Adrian picked up the mooring perfectly first time and Anthem was able to relax on a bumpy but safe mooring. Lyn loaned her dive gear to Joe and we took the gear up to Anthem with Chris acting as a willing and extremely capable rescue dinghy captain. The tanks were filled and Chris dropped us off in a gully near Gary’s inlet, the plan being to drift with the current along Manta Ray wall and back to the Anthem. It was a spectacular dive with stunning coral and prolific fish. Highlight was a huge Coral trout. Later in the day a boat left one of the private moorings inside the stepping stones so Adrian came down to get it. I went in the dinghy to assist because we happened to know that you had to pass a mooring line through the loop under the buoy on this one so Adrian would have a bit on doing this with the girls. The rope wasn’t pulling through the loop because of a rusty metal insert and I managed to get my hand stuck whilst trying to free it. Thanks to Adrian’s quick thinking, releasing the end when this happened I escaped with just a few scratches. 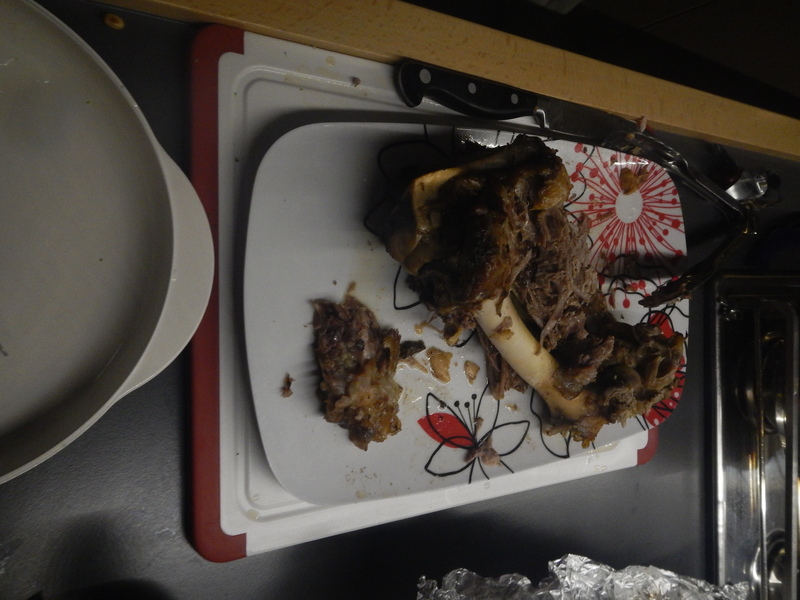 What was left of the lamb when the photographer finally remembered she had a job to do! 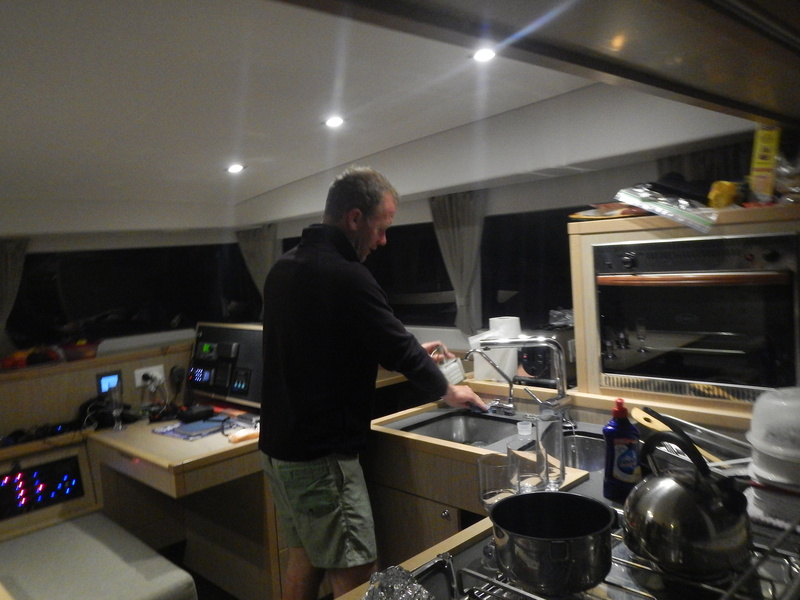 Joey doing the dishes after a delicious feast… how come that never happens on JoliFou? In the afternoon it was the girls’ turn to scuba, with me as the boat boy. 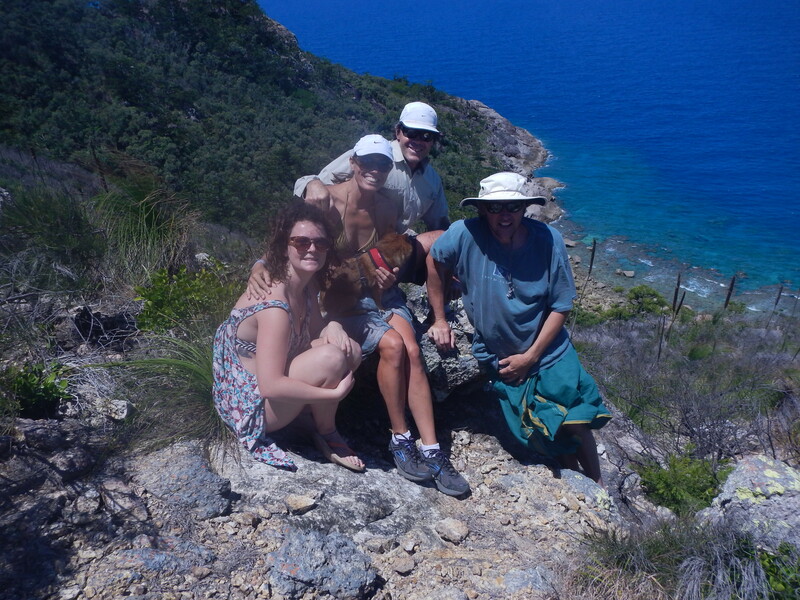 Belinda, Lyn and Ruby had a great dive at Gary’s inlet, with reef sharks, beautiful visibility and coral and many fishes. It was the first time Belinda had dived in very many years and she was a bit apprehensive but did great and thoroughly enjoyed it. Then it was dinner on “One More”, delicious slow roasted lamb by Katrina, roast vegies by Lyn. We took our last bottle of KannonKop South African red and it all slipped down really well, yum. The evening ended with drinks under the stars on the front trampoline. Then time for bed, the end of a big day ……….. Yesterday morning we awoke to find the dive charter catamaran “Wings 3” had moved to the mooring right alongside us. This was highly convenient as they were one of the boats on the dive shop list for tank fills. I asked if we could have our tanks filled and they were extremely obliging, and no charge too – excellent. Adrian has been so generous filling our tanks but his small compressor is noisy and takes about 25 minutes per tank, so it is a bonus when we can save him the hassle by getting the fill done by one of the dive boats with huge compressors and staging tanks which only takes a few minutes. Triathlete Joe came swimming by and stopped off for a very important coffee fix (no coffee machine on “One More”) and we hatched a plan with Adrian to go for a dive at 9. The previous evening we had two young boys from a nearby catamaran come by in their dinghy asking if we had any ice for them. Seemed a strange request but when we enquired further the answer was “no english” and they were off to the next boat. At “One More” they asked for sugar. Joe sent them to Anthem as he knew that Ruby speaks Spanish. At Anthem, on chatting to Ruby, they said that they needed her help please back at their boat. Ruby gamely obliged and went back to their boat with them. Later Adrian, Claire and Laura went over to the cat also and by all accounts had a great time with drinks and dancing on the deck. The truth of the two boys was revealed. Their dad had bet them 100 dollars that they could not get a girl to come back to the boat with them. Ruby had “helped” them to win the bet! It turns out they are Chilean from Patagonia. They briefly stopped by JoliFou on their way to Anthem for breakfast – a lovely bunch of people. Adrian, Ruby, Joe and I set off with Lyn as boat girl to the Manta Ray wall area. We wanted to do the pinnacle chimney, which we had missed the day before, so we started the dive near that location. We saw Lyn’s eel from our previous dive here then dived down to the entrance to the pinnacle. We went up the chimney, through the squeeze gulley at the top and surfaced through a small hole in the reef. There were numerous large fish in the chimney and gulley and swam close by us. Then we dove back down the same way and out along the wall towards Gary’s inlet. We spotted 3 sharks. One small white tip swam very close to us for a while and one shark was quite large but a bit further away. We came across an area that was a maze of tunnels, swim throughs, caves and bommies with schools of small colourful fish and many larger fish too – spectacular. 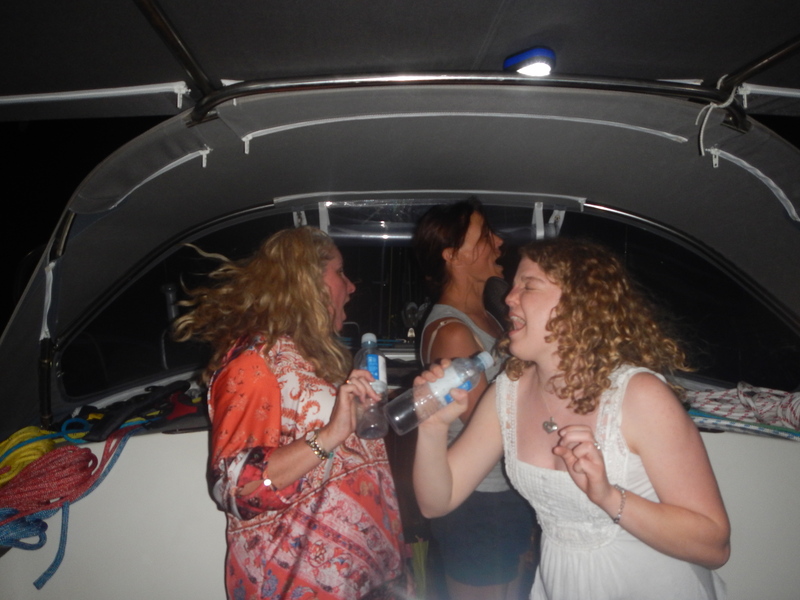 This was the best dive we have done so far and we were all very excited about it. Cateran Bay is lovely with a medium sized beach framed by majestic rocks and hills. We joined the “One More” crew on the beach for sun-downers, then it was back to the JoliFou where we enjoyed watching “The Wolf of Wall Street” courtesy of some movies that we copied from Chris. What a different world, we certainly know which one we prefer. It was quite a restless knight with big bullets of wind in the bay form the building South Easterly and some swell getting in to the anchorage too. We were waken once by the chart plotter anchor drift alarm, but it was just a wide swing. 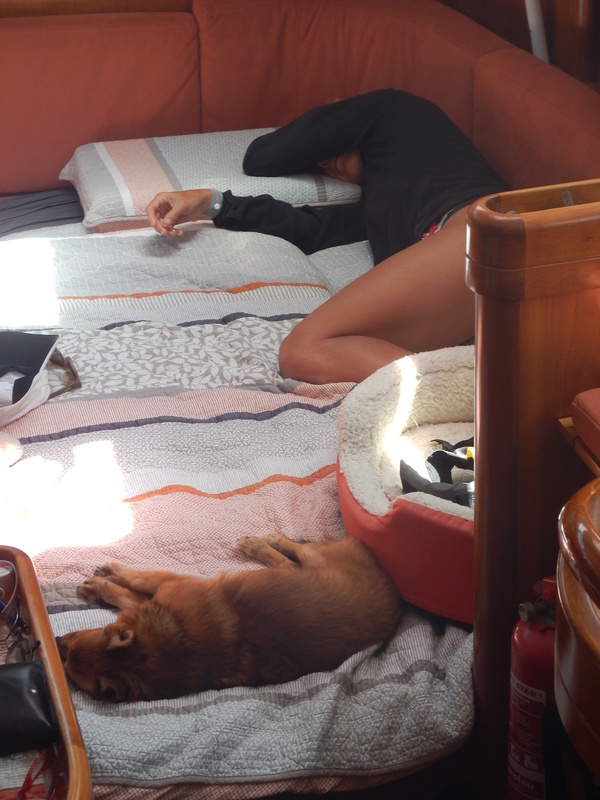 I deployed the sea anchor to dampen the motion of the boat and we got some sleep. The head is throbbing slightly this morning, but there are others amongst us who are a lot worse off following the mega dinner party of last night. The soothing white sands of Whitehaven Beach and the gentle lapping of small waves against the hull does help to soothe the pain tho, but then the peace is shattered by a helicopter or sea plane – ouch! We are anchored only a few meters off and from the cockpit I can hear the natter of the girls on the beach. Yesterday morning we walked up to near the top of the highest hill (mountain?) on Border Island. It was hot work, but the view was spectacular. 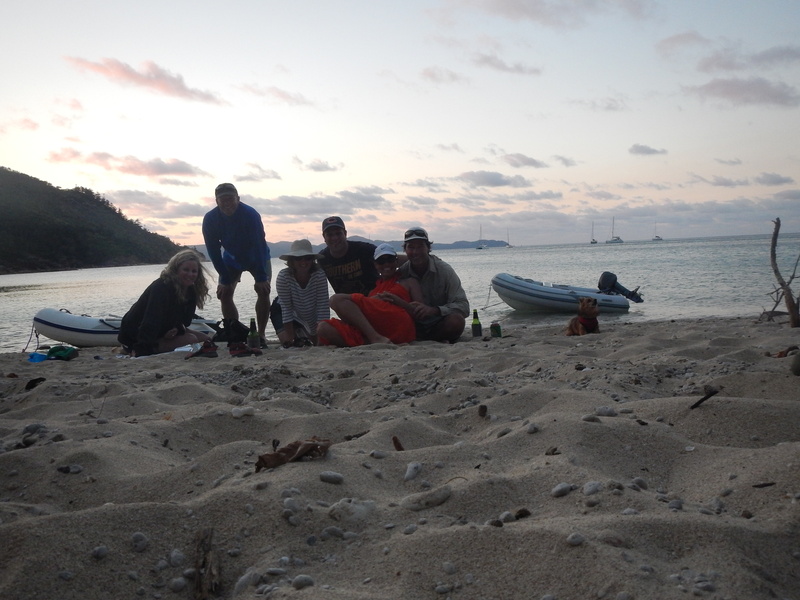 Then it was off to Chalkies Beach for the night. Chalkies is a gorgeous squeaky white sand beach. It has all the beauty of Whitehaven without the madness. It was about time that JoliFou repaid the hospitality we have enjoyed on “One More” and Lyn broke out the lamb back-straps and cooked up a storm. 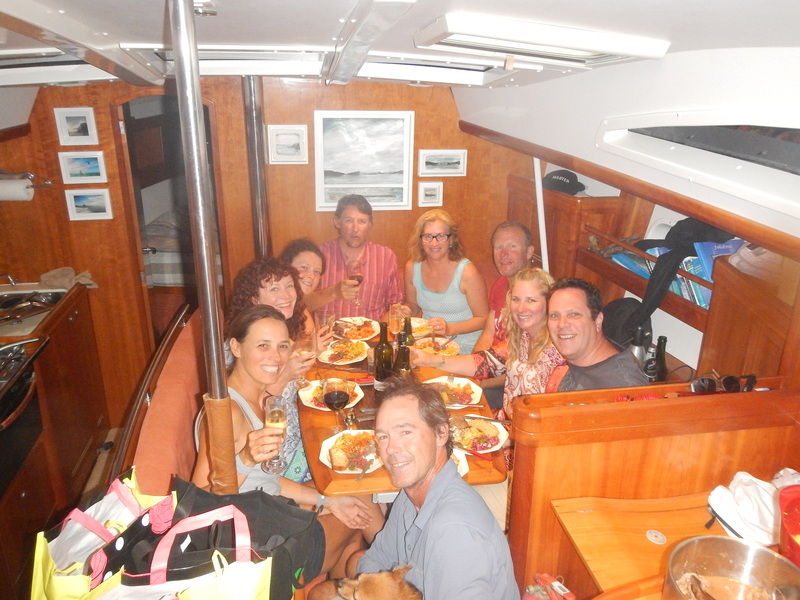 With the Anthem crew invited also, it was dinner for 15 and we all had a great feast, including lamb chops from Anthem and salads from both boats. Adrian brought a few bottles of red from his huge fine wine collection which was delicious. 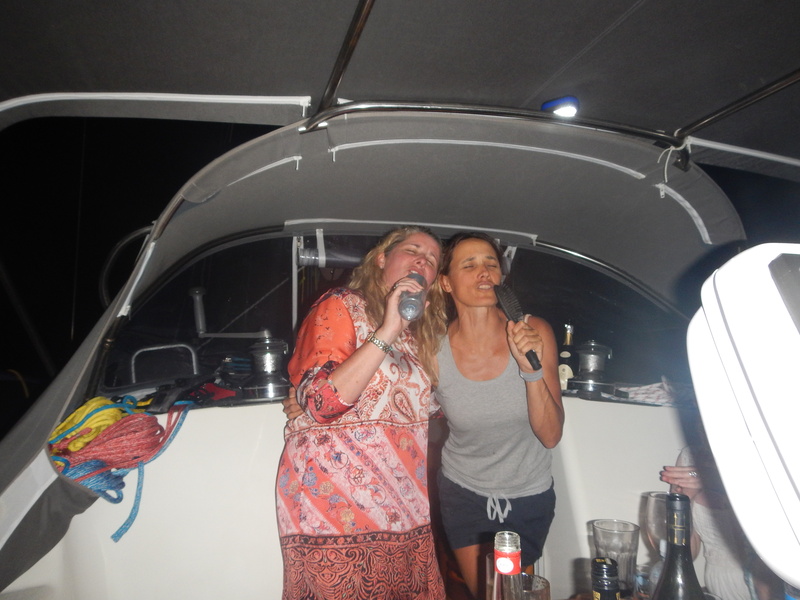 A great time was had by all and when the wine finally ran out we broke out the dreaded French white rum. Potent stuff. Some (Claire) failed to heed the warning and treated it like a shot (she is suffering the most today). 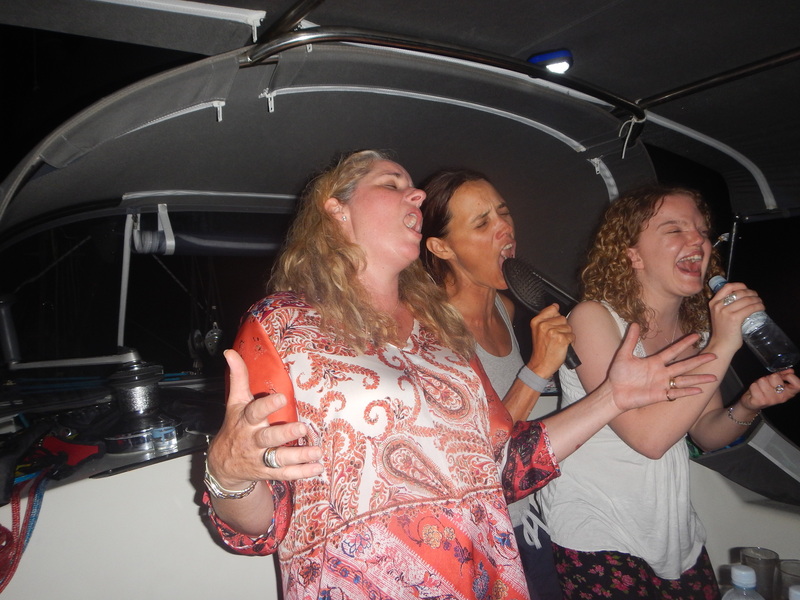 As the evening appeared to be winding down suddenly Abba started blaring out of the cockpit speakers and Agnetha (Lyn) appeared center companionway, hairbrush mike in hand. The show had begun! Katrina and Laura were soon up there, belting out the lyrics too and soon everyone was singing along. A great night, I haven’t laughed so much in a long time. Poor Chris bore the brunt of the punishment, as on climbing out of the dinghy at “One More” he lost his balance and landed on the sharp point of a winch, cutting his elbow open. Not sure which hurts more this morning, the head or the elbow, we have yet to see him surface. By jolifou in Uncategorized on October 4, 2014 . WOW-really living the dream. So easy and enjoyable to read Bruce. Lyn, I’m home and exercising hard Birdie girl. I think that cruisers’ midnight you are referring to is designed for me! Enjoy every minute and keep writing.